When deciding to send money overseas whether, for business or personal reasons, the first instinct for many of us is to use a bank. However, depending on the level of funds to be transferred, you could end up making significant savings taking into account all of the options available. Whether you are a business owner making regular international payments or a personal customer making a one-time purchase, check out the top five things you should consider before making that important transfer. The fluctuations in foreign exchange rates, even in a very short space of time, are not uncommon. Getting the best exchange rate possible is supreme in order to secure the best value for your transfer. Remember, a more favourable exchange rate on a large sum of money could save you a significant amount of money. Foreign exchange company in North India give more favourable rates than banks so it is important to do your research. 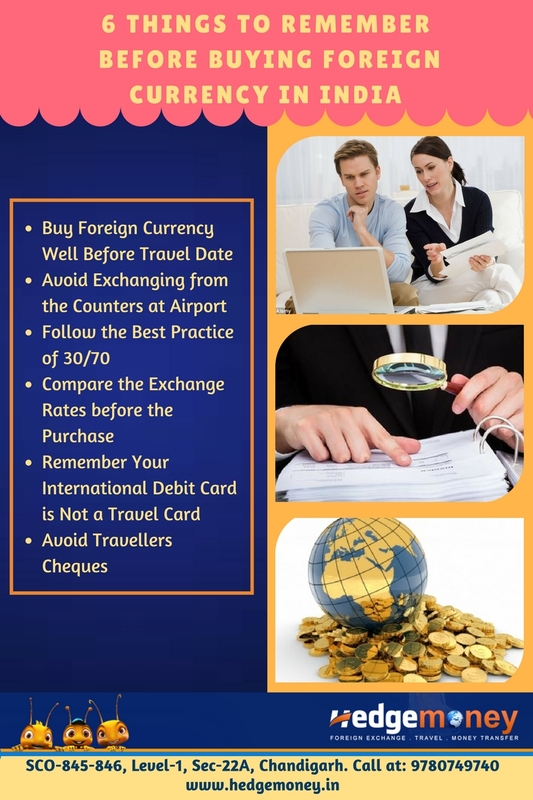 Fees and charges are very important cost factor when sending money abroad. Both banks and currency specialists charge fees so you will need to be aware of transfer charges and overseas bank receiving fees. Ask about the entire fee, so that you do not end up paying more than expected because the fee can make money transfer expensive. Some banks have set amount to transfer any amount of money. The fees vary from one bank or money transfer organisation to another, and even by the country where you want to send money. 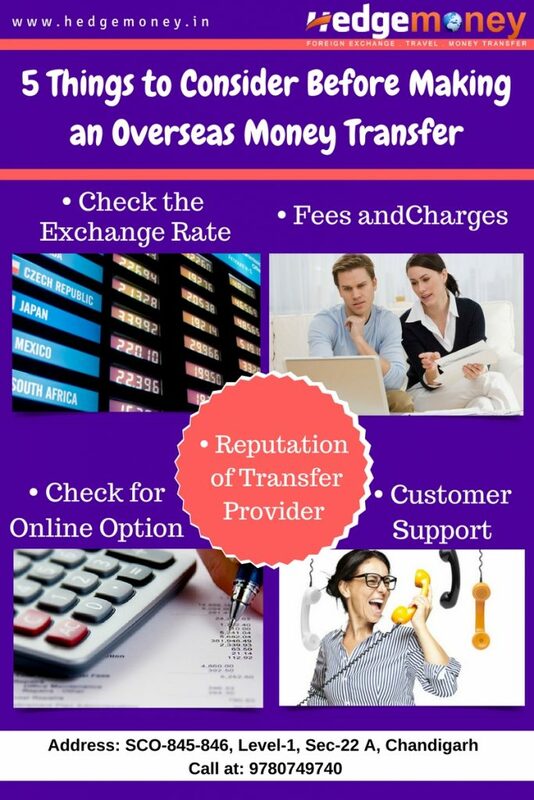 Providers of money transfer services in Chandigarh are becoming a popular alternative to banks when making overseas payments. Before engaging in a foreign currency transaction with any specialist or bank, it is both overriding and easy to determine whether a particular firm is authorised by the appropriate regulatory body to carry out money transfers. The customers should check the register to see if the transfer specialist is authorised or registered by the Reserve Bank of India (RBI). Authorised firms usually afford higher protection as they safeguard client’s money by keeping it separate from company funds. Strong balance sheet and a long trading history are also good indicators that the company is reliable. Most money transfer companies now offer an online platform for customers. You will need a photo identification proof, proof of address details and further possible documentation for compliance purposes but once you are set up with an online account, transfers can be made 24/7 from the comfort of your own home. Beneficiary details are also stored for subsequent transfers and payment history can be viewed at the touch of a button. Having help at hand is always beneficial in case you face problems or have doubts. 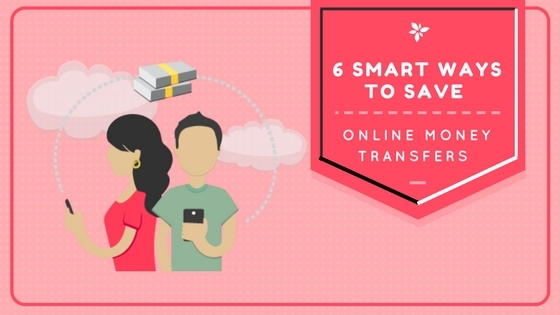 Keeping you informed is a vital component of the entire money transfer process. An efficient customer support team should be available to assist you with the initial account setup. The team should address any issues with transfers from initiation to receipt of funds by the beneficiary. Before deciding on which company you use, make sure that you are comfortable with the customer support service by making a few calls to the firm. 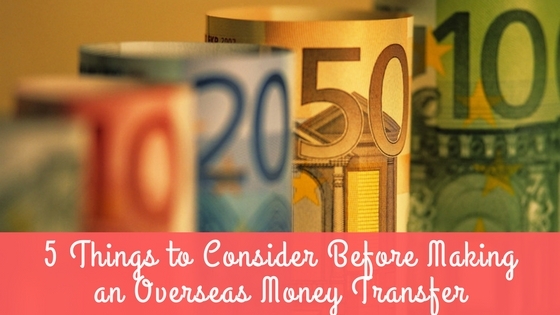 Considering these points will be helpful when you look to transfer money overseas. 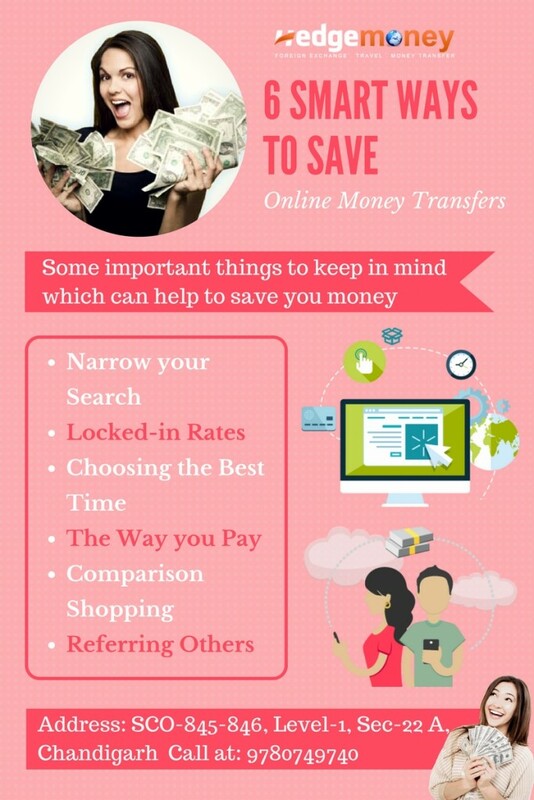 And also, doing a little research can help you find the best companies offering money transfer services in Chandigarh. Readers! Please like and share this blog post. As currency rates can fluctuate a lot, it is good to get a foreign exchange at least a week before or in the worst case around 3 days before you are planning to travel. If the rates are higher you can wait for 2 or 3 days to check if the rates are declining any more. Moreover, you can avoid last minute hurry in this case. It is not really worth exchanging foreign currency from foreign exchange counters available at the airport as it comes out to be an expensive option. These outlets charge a commission of 10 to 15%. As you are left with no other choice you cannot even bargain. You lose a considerable amount of cash and your plans change even before you begin your travel. Make a rough estimate of the amount you will need for the entire trip. You can carry up to 30 % in cash that can be used to pay for the taxi and other necessities where cards are not accepted. The remaining 70% can be in the form of Forex travel card. There is better rate available on Forex card and it is safer too. You can order a prepaid card online without any hassles. Exchange rates vary from vendor to vendor. You must compare the rates offered by at least 3 providers before your final purchase. The exchange rates can easily be compared these days online. Most of the companies offering money transfer services in Chandigarh provide facilities to place the order online. You can also avail home delivery within a day from any preferred provider. The debit or credit card that is issued in India includes currency in INR. When you swipe it outside India the transaction does not happen in Indian currency. This foreign currency transaction includes a conversion markup ranging up to 5 %. The Forex card is a better option as it carries local currency and is devoid of any such markup. Travellers cheques are not used frequently these days and have become a thing of the past. They have been replaced by the Forex Travel Card services these days. These cheques are not accepted in several places and most of the overseas merchants or banks that accept them charge nearly 4 to 6 % commission while en-cashing travelers’ cheques. You can keep a spare Forex travel card with you that can be used in case of any emergency. It is better to consider a RBI authorized Forex dealer. The fund transfer can be used instead of cash payments while buying foreign exchange. The fund transfer makes the transaction transparent and traceable. 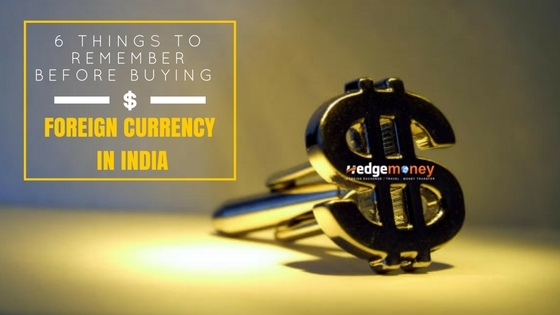 Just by keeping all these points in mind, you can find better deals on foreign currency. If you like these points or want to add something else, please let us know by sharing your comments below!